Study shows lack of standardization across U.S.
Photo: These maps show states’ physician discipline rates by decile. 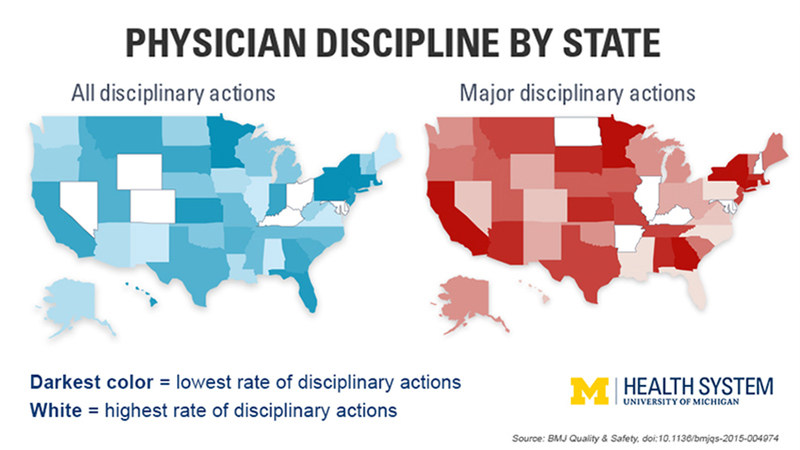 In fact, the percentage of doctors who get disciplined or pay a malpractice claim is four times less in some states than the percentage in other states, University of Michigan Medical School researchers show. And since there probably isn’t a fourfold difference in the actual behavior of doctors, the reason for this difference lies in the wide variation between states in their regulations, procedures and resources for punishing doctors who do wrong. Consumer advocates have noted variation between states’ physician discipline rates and standards in the past. But this study, published in BMJ Quality and Safety, is the first nationwide academic evaluation of the topic, and uses statistical techniques to more reliably calculate the actual situation in each state. Delaware, Kentucky and Ohio came in with the highest adjusted rates for all disciplinary actions. But it’s the states with the lowest rates — such as Massachusetts, New York, Connecticut and Pennsylvania — that should probably look the hardest at their current standards, say the researchers. Harris and his co-author, Elena Byhoff, M.D., research fellow and clinical lecturer in internal medicine, are both Robert Wood Johnson Foundation Clinical Scholars at the U-M Medical School and the U-M Institute for Healthcare Policy and Innovation. This is the latest study of physician misbehavior by Harris. He has also studied how the rise in female practitioners in his specialty has affected the rate of allegations of sexual misconduct against OB-GYN doctors. The data for the study came from the U.S. Department of Health & Human Services’ National Practitioner Data Bank, which covers all 50 states and the District of Columbia. The researchers focused on the most recent data available, for 2010 through 2014. The NPDB includes information about punishments ranging from minor fines or required monitoring, to major actions such as revoking or suspending a doctor’s medical license. It also includes information on payments made by doctors in response to malpractice claims, which the researchers used to create a measure of the malpractice climate in each state. It doesn’t include actions taken by individual hospitals that don’t get reported to the state medical board. Hospitals, clinics, state medical boards and insurers routinely access the NPDB when making decisions about which physicians to hire, credential, license or include in their networks. Patients can’t access it, and public access to state-level information about individual physicians varies greatly by state, Harris says. For the U.S. as a whole, they show that there are 3.75 disciplinary actions each year for every 1,000 physicians practicing — including 1.15 serious disciplinary actions. But the yearly range among states was huge, from 7.93 disciplinary actions of any type per 1,000 physicians in Delaware down to 2.13 per 1,000 in Massachusetts, and from 2.71 major actions per 1,000 physicians in Delaware down to 0.64 in New York. “In one state the punishment for a particular violation could be a fine, while in another state you could lose your license for doing the same thing,” says Byhoff. He adds that this has implications for the ability of physicians to move from state to state, if their punishment in one state is not enough to keep a hospital or practice in another state from hiring them. The U.S. is actually one of few countries that lack a national system for overseeing and punishing physician misbehavior. Australia recently changed over to one, after decades with each state or territory having its own medical board. Studying other countries’ systems compared with the state-level systems in the U.S. could yield further information about how to address variation and protect the public, Harris notes.